If you couldn’t already tell from The Lion King themed party I recently had, I am really excited for The Lion King Blu-Ray re-release! 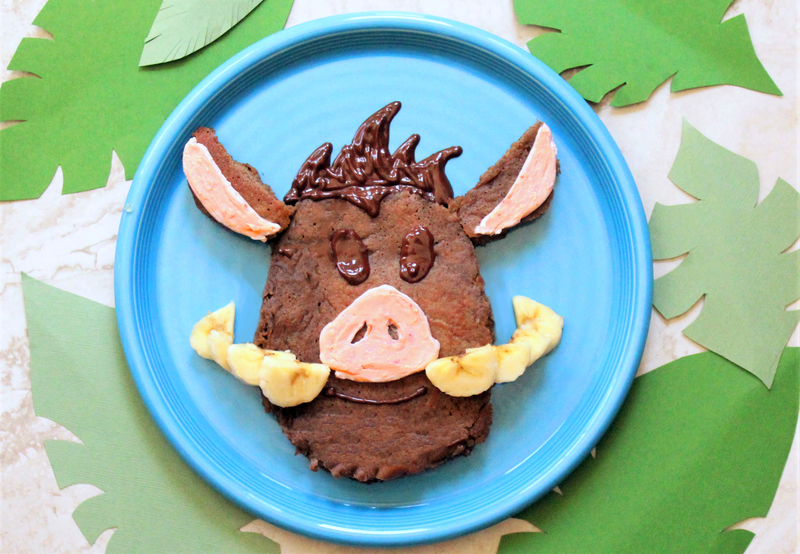 To celebrate Disney Family’s #DisneyWeekend Lion King theme, I decided to start the weekend off with some healthy chocolate pancakes modeled after the Pumba Emoji from Disney’s Emoji Blitz game! 1. Whisk together flour, salt, baking powder, cocoa powder, and baking soda. 2. In a separate bowl, whisk together egg, milk, maple syrup, applesauce, and coconut oi. 3. Coat the bottom of a pan with oil, and place your batter in the shape of Pumba‘s head, and place two smaller amounts of batter in the shape of Pumba‘s ears. (The batter is very thick, so it’s easy to form the shape you like with the edge of a spoon or spatula). Or if you prefer, make two large pancakes and cut the shapes out after your pancake is cooked. 4. Cook on medium heat until golden brown on both sides. 5. Cut a small banana in slices and place them in the shape of Pumba‘s tusks. 6. In a piping bag with a large round piping tip, pipe on strawberry cream cheese for Pumba‘s nose and part of his ears. 7. Melt dark chocolate with your coconut oil in the microwave or on the stovetop, and pipe on using a small round baking tip for Pumba‘s eyes and hair. I would love for you to Tweet or Instagram tag me in how you’re celebrating The Lion King this weekend! Hakuna Matata!